Make sure your chickens are getting the right size meals to make the eggs or meat you're raising them for. Farmers are concerned with the feed conversion ratio, which is how efficient an animal is at converting feed into a certain number of eggs or amount of meat. For the business of farming, the feed conversion ratio helps determine the bottom line. Backyard flocks are a bit different. As their keepers, we’re often the only consumers of their products. But, raising chickens is still an investment, however small the flock might be. Backyard chicken keepers still want to minimize waste, because wasted feed is wasted money. So, how much should chickens eat? Or, how much should we feed our chickens in order to reduce waste? According to the University of Kentucky College of Agriculture’s report “How Much Will Chickens Eat,” a laying hen will eat 1/4 pound of feed per day, and roosters a bit more, but other variables affect how much a chicken will eat. Commercial broilers and layers are, overwhelmingly, raised in confinement—they are feed-conversion-ratio machines, and their egg and meat products make up their greatest energy output. However, the energy output of backyard chickens with access to more space includes running, flying, foraging, playing, preening and dust bathing. 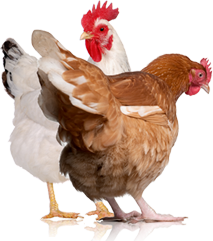 Backyard chickens need more food energy to continue those activities and to continue laying eggs consistently. 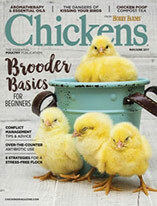 For backyard chickens, the 1/4 pound of feed per hen estimate is low, even for summer free-rangers, and far too low for any backyard flock in the winter months. Access to supplemental foods, like insects, yard greens, garden waste and the contents of compost bins, increases access to food energy without increasing feed consumption. 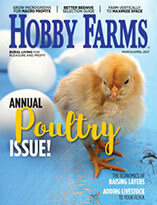 An active free-range hen could very well eat her estimated quarter-pound of feed throughout the day while still feeding on the yard, picking and choosing her own diet. During the foraging seasons of the year, offering feed once in the morning and once before dusk is a good way to control feed consumption and waste, while also encouraging foraging for food energy and activity. Human food scraps are a great addition to a flock’s diet, but for optimal health, nutrition and egg production, scraps should never replace feed. In the summer, chickens usually won’t eat during the hottest hours of the day, because digesting food creates more heat. This is a good time to practice morning and evening feeding, while providing cool places to rest, forage and drink throughout the day. Summer’s heat often reduces feed costs. During the winter months, access to forage and other natural foods is greatly reduced. The desire to eat more feed increases with the need to produce more body heat. Winter nights beg the fast-burning energy of scratch grains as a supplement to grain feed, but scratch should never replace a complete feed as a food source. Winter is notorious for increasing feed costs, often by double. When chickens run out of drinking water, they stop eating. UK’s report advises that 2 pounds (or 1 quart) of water is required for every 1 pound of feed, but like foraging and pecking through mash feed for favorites, backyard chickens not only prefer to self-regulate, they’re very good at determining their individual needs. Always supply fresh water. Pay careful attention to how much your chickens eat at different times of the year. If you offer two feedings per day in the summer and continual access through winter, know that if chickens run out of feed, they probably haven’t had enough to eat.